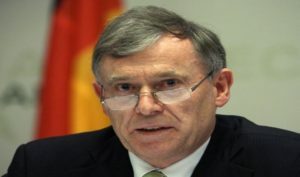 UN Secretary-General Antonio Guterres has reportedly chosen former German President Horst Köhler to serve as his Personal Envoy for the Sahara, in replacement of US diplomat Christopher Ross who has resigned a month before the end of his term, on March 31. Köhler’s candidacy should be endorsed by Morocco and the Algeria / Polisario tandem that have not yet given their final approval for his official appointment. Horst Köhler, 74, is member of the Christian Democratic Party (CDU) of German Chancellor Angela Merkel. He had also held the posts of President of the European Bank for Reconstruction and Development (EBRD) until 2000, and Managing Director of the International Monetary Fund (IMF). In any case, if the former German President is not picked for the position of UNSG’s Personal Envoy, another European will be chosen to succeed Ross, as custom has it that the posit is held alternately by an American and a European. According to this (geographical) logic, it is the turn of a European to occupy this position. The Sahara issue, which is in the hands of the United Nations, will witness further changes this April, notably at the level of the UN mission in the Sahara “MINURSO”, whose mandate, ending at the end of April, should be extended for one year. Meanwhile, talks held earlier this month by Morocco’s Ambassador to the UN, Omar Hilale and Antonio Guterres resulted in the lifting of the Moroccan veto on the return of the 17 MINURSO peacekeepers. The peacekeepers can now join their headquarters in Laayoune, wherefrom they were expelled by Rabat a year ago, along 60 other civilian agents of the UN mission. The fifteen members of the Security Council are due to discuss the latest developments in the Sahara in light of the annual report they have apparently received from the UN Secretary-General on April 7. It is on the basis of this report that the rotating presidency of the Security Council, currently held by the United States, is to submit a draft resolution on the Sahara. The draft will be examined by the five members of the group of friends of Western Sahara (USA, Russia, France, Great Britain and Spain) before its adoption on Thursday April 27.